About 350 people gather in front of City Hall to support the organization after 27 protest outside its offices a few blocks away. 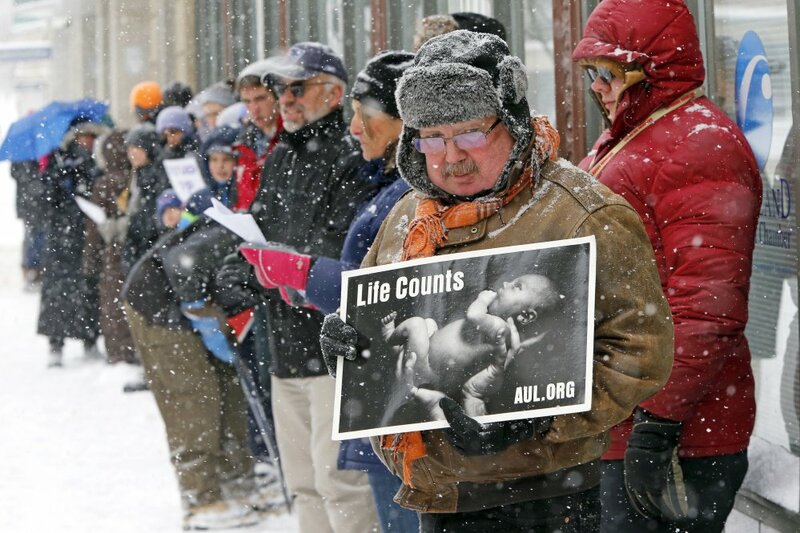 About 350 Planned Parenthood supporters stomped their feet to keep warm and cheered in blowing snow outside Portland City Hall on Saturday as the Time and Temperature Building sign flashed the temperature of 12 degrees. 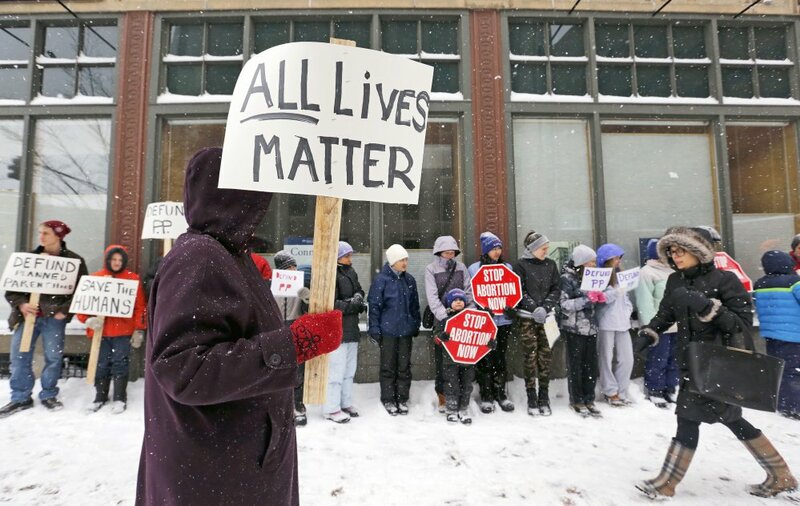 Two hours earlier, 27 anti-abortion protesters gathered outside the Planned Parenthood offices just up the street from City Hall. 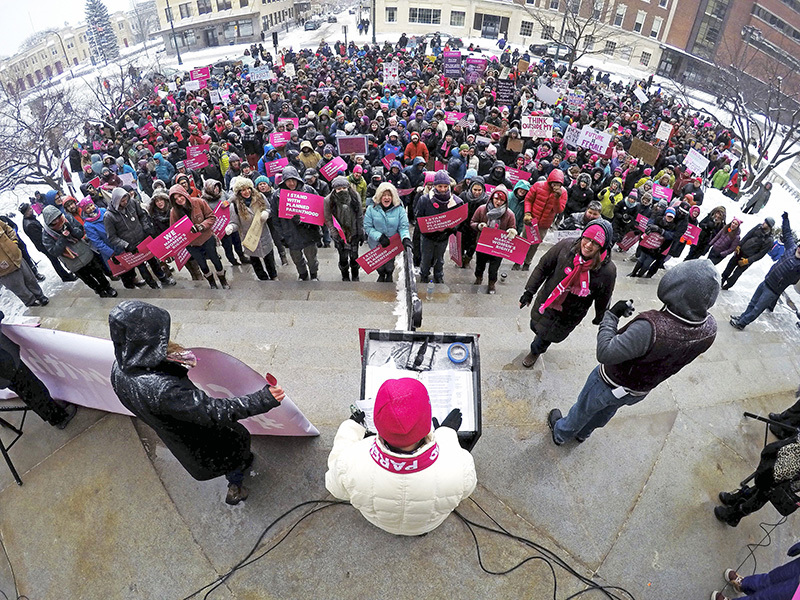 It was a scene played out across the nation Saturday, as opponents and supporters of the women’s health organization lined up, sometimes across the street from each other. At City Hall, the crowd filled the plaza and spilled into Congress Street. “I am here as a woman, a mother, a grandmother and I am your woman in Congress,” said U.S. Rep. Chellie Pingree, D-1st District. 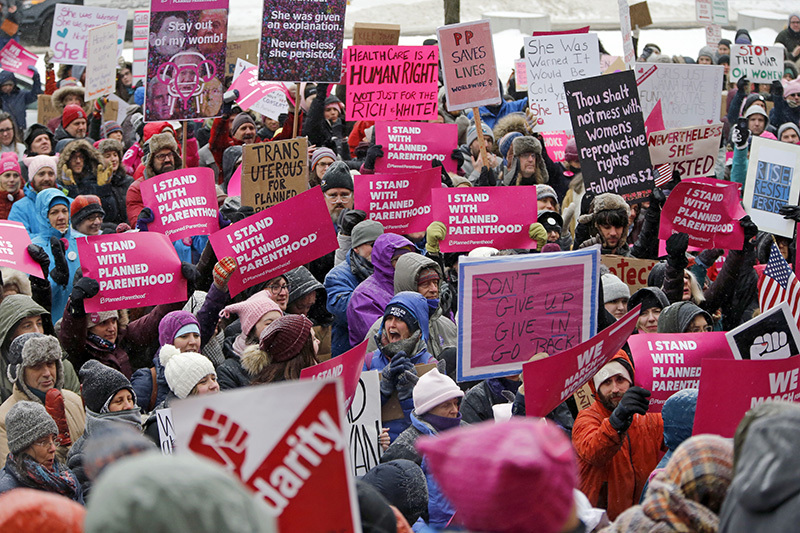 Planned Parenthood supporters are trying to stop House Republicans who are looking to slash federal funding to Planned Parenthood as part of their effort to repeal the Affordable Care Act. Anti-abortion activists say they have been energized by the election of President Trump, who has pledged to restrict abortions. Vice President Mike Pence has long been opposed to abortion. If Republicans succeed, the women’s health care organization stands to lose $400 million in federal funding in the first year of enactment. Planned Parenthood receives money from the Medicaid program for non-abortion-related health services to low-income women. It also receives government reimbursements for contraception services from another source. 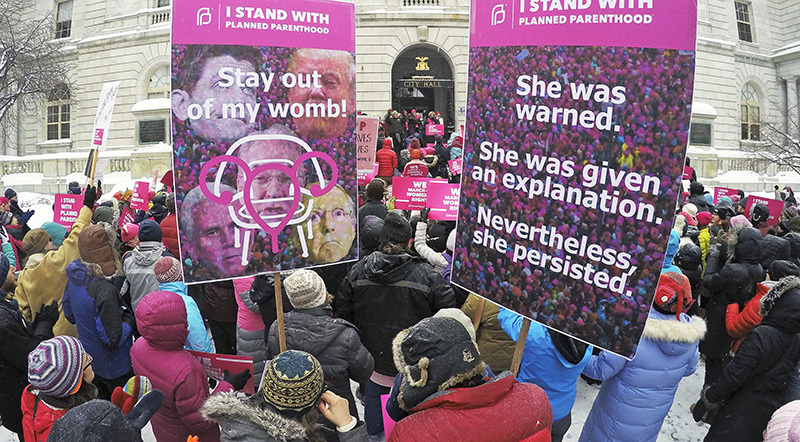 The nonpartisan Congressional Budget Office said about 400,000 women would lose access to Planned Parenthood services if Republicans prevail. 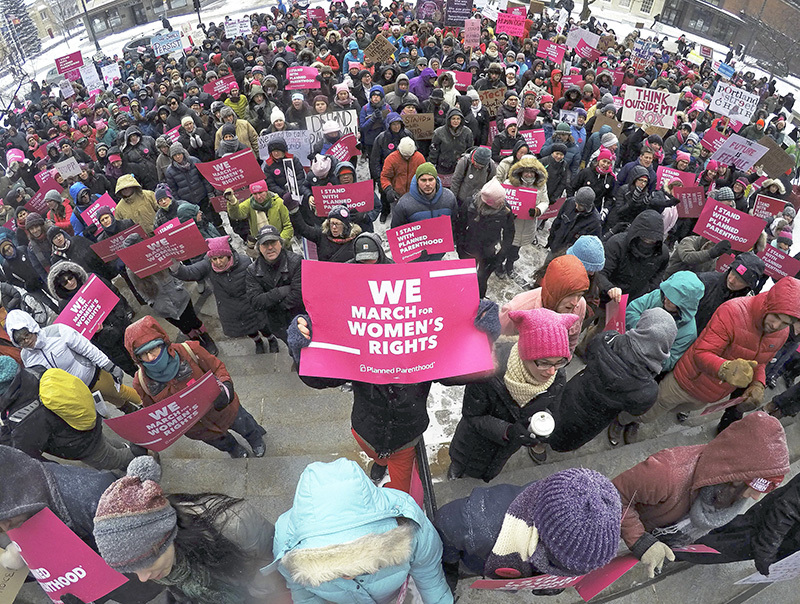 Most Republican legislators oppose Planned Parenthood because many of its clinics provide abortions and sometimes provide fetal tissue for research, which is legal if no profit is made. But U.S. Sen. Susan Collins, R-Maine, does not support defunding. Collins has said she supports a group of House Republicans led by Rep. Charlie Dent, R-Pa., who are working to retain funding for Planned Parenthood. Thousands of protesters have showed up around Portland in the three weeks since Trump took office to protest his policies on issues such as immigration and health care. 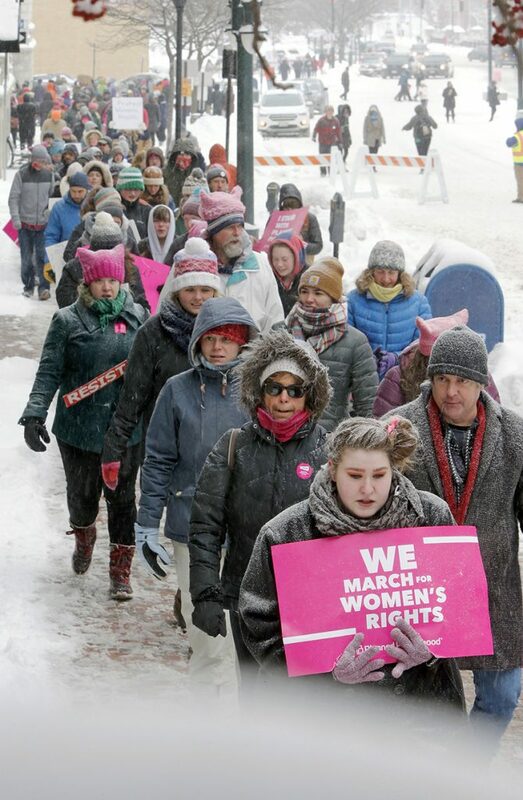 Saturday’s Planned Parenthood rally drew some women who had traveled to the Women’s March in Washington last month, such as Mary Hiers of Hallowell. “I am a social worker and the mother of a daughter who is 30,” said Hiers. She said she received Planned Parenthood health services as a teenager into her late 20s and wanted to give the organization her support. Landis Hudson of Yarmouth, who described herself as the mother of twin 15-year-old daughters, said she was returning some books to the Portland Public Library when she spotted the tail end of the anti-Planned Parenthood protest next door and decided to join the supporters down the street at City Hall. “I was infuriated and appalled. It is just so shortsighted,” Hudson said. “No, I am not discouraged. We are not bean counters. If (the protest) impacts just one person, that is all that matters,” said Leslie Sneddon of Richmond. Sondra DeLorenzo of Jefferson said she joined the anti-abortion protest because she doesn’t want her tax dollars to go to Planned Parenthood. 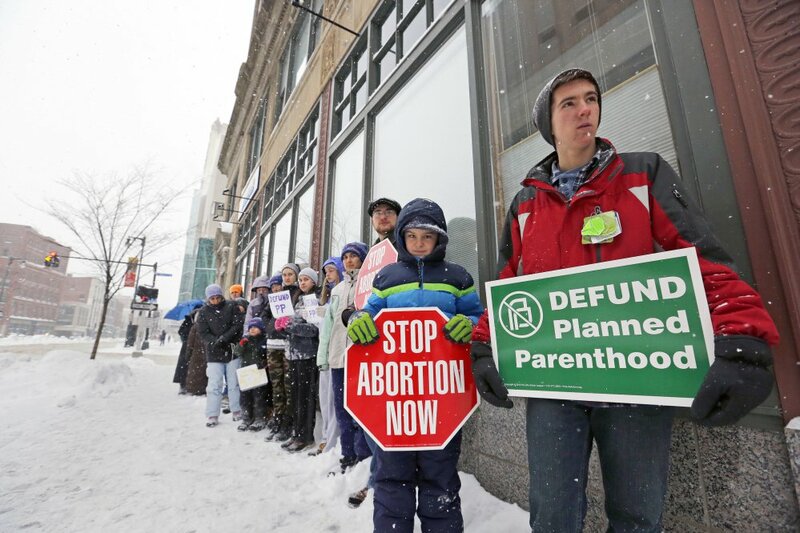 “I am here to kind of help people around the idea of the dehumanization of abortion,” DeLorenzo said.